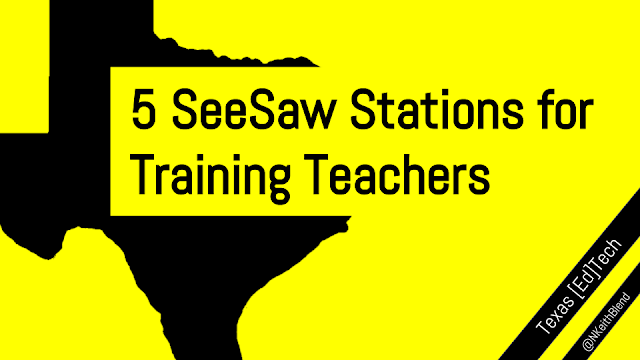 Texas [Ed]Tech: Why I'm not becoming a Google Certified Trainer. Yet. 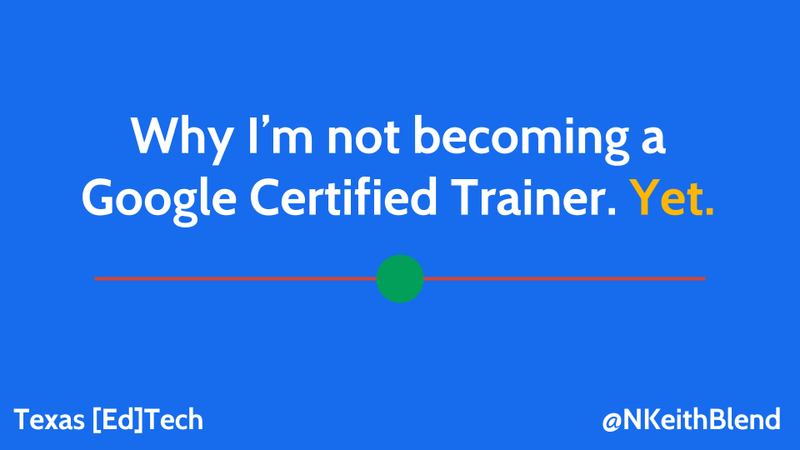 You have certainly expressed some of the concerns I felt when I initially became a trainer. I vowed then that I would always focus on the learning, and not the tool. 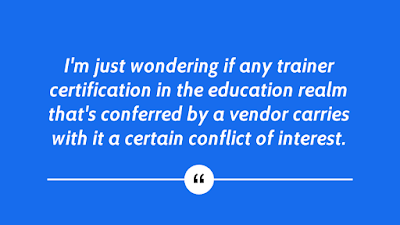 That's just sound pedagogy. If I don't reach my required sessions, so be it. But that hasn't happened yet, since I ended up training quite a bit more often than I had anticipated. I applaud your focus, and I believe that's at the core of every good educator - a keen sense of who we're serving. If the tool fits, great. If it doesn't, it's time to look elsewhere. Keep on doing what you're doing: it's the right path to take! Integrity is a commendable character trait. Doing what is best for kids HAS to be the focus of anyone who calls him/herself an educator. 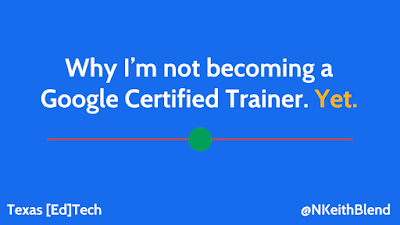 Just became a Google Certified Trainer last week, and as an administrator with very little time on my hands, I worry too whether that stipulation puts undo stress on my position. Reflecting more deeply however my entire professional world revolves around training staff and students in the best tools for the job. Sometimes it is a Google product, sometimes not. 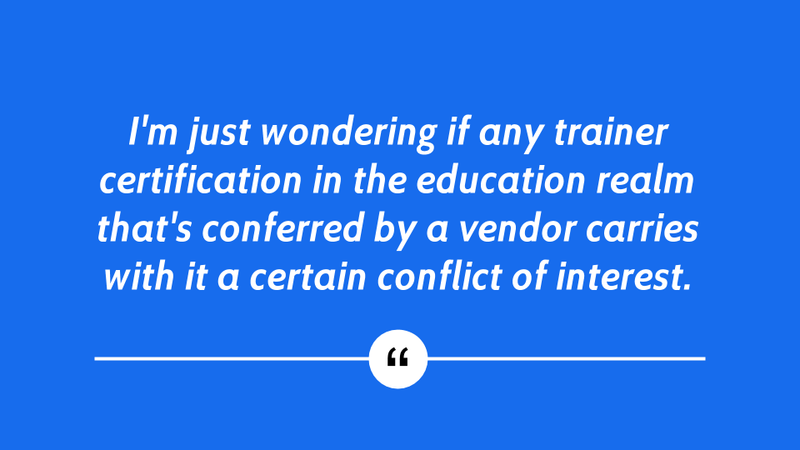 Either way, I believe at the end of the day there will be a surplus of trainings that will occur to meet the requirements. If not, I bow out and am still a friend of Google. I went down this same road a while back, but not for the same reasons. Essentially, the need to have "trainer" as an official designation, when I am already a teacher, just did not make sense to me. I am certified by the governing body where I teach - and am so for life unless I really screw things up. Thing is, for 25 years I have been training students (and colleagues). 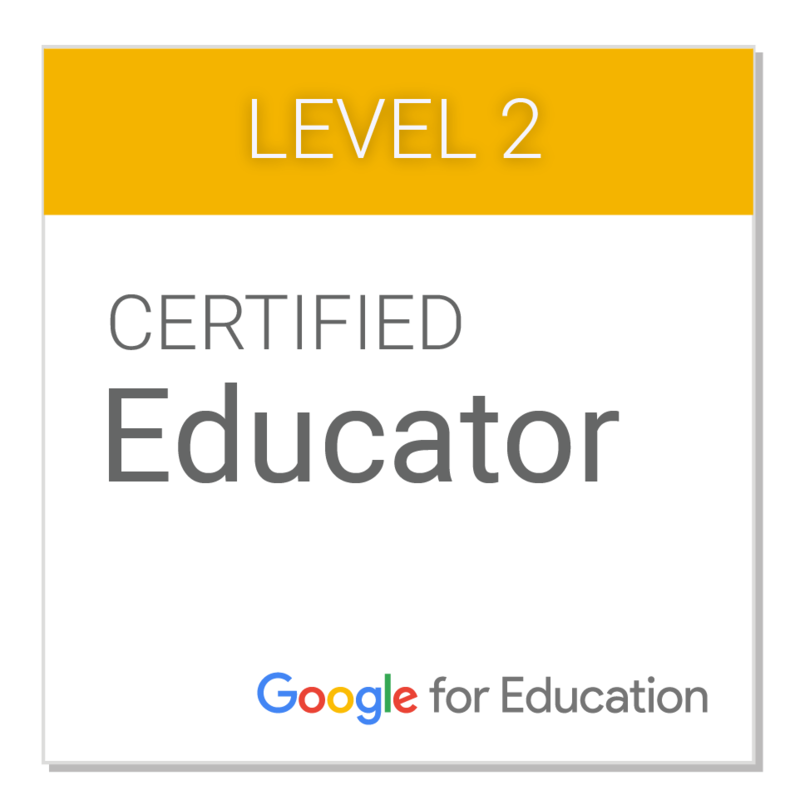 Having my level 1 and 2 certification was more about me feeling confident in really knowing the G-suite rather than anything else - and the fact that google is the best when it comes to practical and inexpensive (FREE!) apps and tools for students. I will stick with who I am now - a teacher - and maybe when I retire I will see my way to become a trainer and freelance or whatever. Thanks for the thought-provoking post.